A cultural and tourism complex has been created within the Royal Pump Rooms Building. The town of Leamington Spa was originally known as Leamington Priors and until about 1800 it was only a tiny village. The mineral springs were known in the Middle Ages, but it was not until 1784 that inhabitants of the village began re-discovering its saline springs and started building baths around some of them. In July 1814 "The Royal Pump Room and Baths", designed and built by C.S.Smith of Warwick at a reputed cost of £30,000, were officially opened. The Spa treatment was claimed to cure, or relieve, a huge number of disorders - examples being "stiffness of the tendons", "rigidity of the joints", "the effects of gout and rheumatism and various paralytic conditions". The spa water is also a mild laxative! Physiotherapy and hydrotherapy treatments were available at the Pump Rooms until the late 20th century, but by the 1990s after two world wars and declining fortunes, the problems of rehabilitation looked almost insurmountable. The owners of the building, Warwick District Council, in collaboration with Warwickshire County Council, produced proposals to relocate Leamington's Art Gallery, Museum, Library and Tourist Information Centre to the Pump Rooms, to refurbish the Assembly Rooms, and to provide a new tea room, so creating a major cultural and tourist attraction. 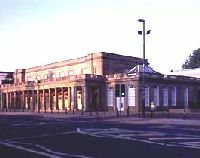 The new building opened to the public in Summer 1999, safeguarding the future of the historic Pump Rooms for the 21st century. The Art Gallery is located in the former hydrotherapy pool at the Royal Pump Rooms. It provides a stunning location for the display of Warwick District Council's permanent collections of 17th century paintings and 19th - 21st century paintings and craft by major British artists and makers. These include nationally important artists and makers from the region such as: Gillian Wearing, Terry Atkinson, Sir Terry Frost, David Jones, Simon Lewty and Jane Moore. The spa heritage galleries are on the site of the exotic former Turkish Bath, which dates from 1863. The displays tell the story of Leamington's development from a rural village to the modern town of today. Particular emphasis is placed on the discovery of the spa water and how the local community used it to develop Leamington as a health resort in the 19th century. All the permanent displays include interactives developed principally for children, and are accessible to visitors with disabilities. The "Hammam", or Turkish Bath, survives at the very heart of the building and has been restored to its former glory. This is a room with strong Islamic influences in its style, colouring and stained glass. Some of the glass is the restored original, the rest is newly made to complement it by artist and designer William Nichol. The original paint work, tiles and brickwork have been uncovered and the original decorative scheme restored.